Philip and Den Lennie had given a webinar about shooting cinematically in the morning and it was good to meet up outside of the strange twilight zone of the internet. It was also great to meet James Miller (below). 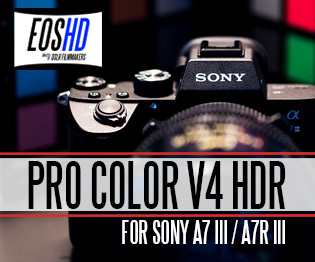 The A7S seems like a popular camera at the moment for some reason! Den’s A7S footage was projected in the Sony digital theatre. This was the 4K footage shot in Japan, along with his camera tests and 1080p footage shot in his native Scotland. His 1080p split screen of A7S vs the 5D Mark III on the big screen made the 5D look out of focus and that is just the internal XAVC-S codec. 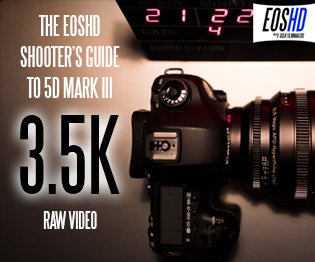 The 5D Mark III material was plain old H.264 not raw I believe, but fact remains it just didn’t hold up on a cinema screen. The A7S XAVC-S did, from tiny file sizes. 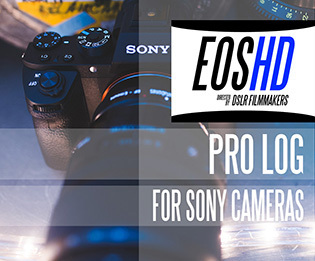 How did the 1080p from the A7S compare with the 4K output? I could certainly tell the difference on establishing wide shots, but for any shots where the focus was closer-in on the subject, especially human subjects – well, the fine detail still leapt off the screen in 1080p. There’s no doubt that 4K is better but there’s also no shame in projecting 1080p onto a massive cinema screen either, if that is what you choose to shoot. As always these gatherings are of course about the people and it was great to get so many camera geeks under the same roof. Sony and others I am sure are getting some good ideas through doing this and I’d like to see it become an even more regular occurrence. Sony’s Kanta Yamamoto was on hand to take feedback. A big part of Kanta san’s role is to focus on the video modes so it is good to see more dedicated people catering for filmmakers. Kanta was parachuted in from the pro Sony divisions, so really understands the dual consumer / pro focus of the A7S video capabilities. Atomos had a presence at the Sony facility, good to see such close ties between the two. 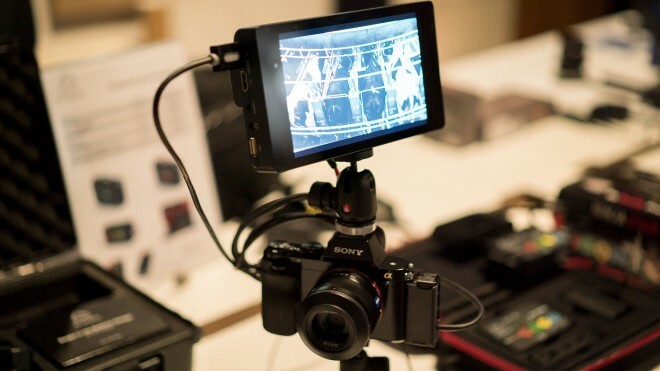 Above is the eagerly awaited Atomos Shogun 4K recorder mounted atop the A7S. Behind that you can glimpse the Ninja Star which I am using with my A7S right now (review coming soon). I asked if the Shogun would also record ProRes LT and Proxy like the Star for smaller file sizes in 4K and was told that it does. I am very impressed with the lightweight 4K codec on the GH4 at just 100Mbit/s and ideally I do not want to go back to the huge file sizes at 800MB/s… Something between the GH4’s codec and 4K ProRes HQ at 800Mbit/s would be ideal for me. The quality of the Shogun’s screen was absolutely staggering and it will be invaluable to load our own LUTS for S-LOG onto it while shooting – but I’m determined to find a better way to rig it than the top heavy configuration of putting it on the hotshoe. With it being quite a large monitor too, not just a recorder, I wouldn’t trust that the A7S’s little hotshoe would stand up to the rigours of everyday usage. 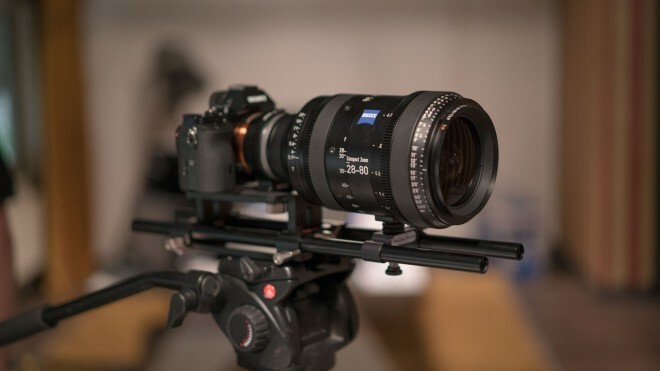 Above: Zeiss 28-80mm full frame cinema lens on the A7S. 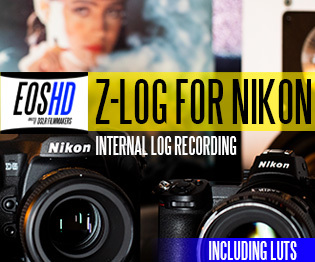 Unlike the Convergent Design 7Q which still does not accept 4K from the A7S and uses proprietary SSDs the Shogun makes use of standard 2.5″ SSD drives. They also had a caddy for CFast cards (which the Ninja Star uses) so you can use those on the Shogun as well. That makes transporting lots of drives around a location far easier as the CFast cards are tiny. 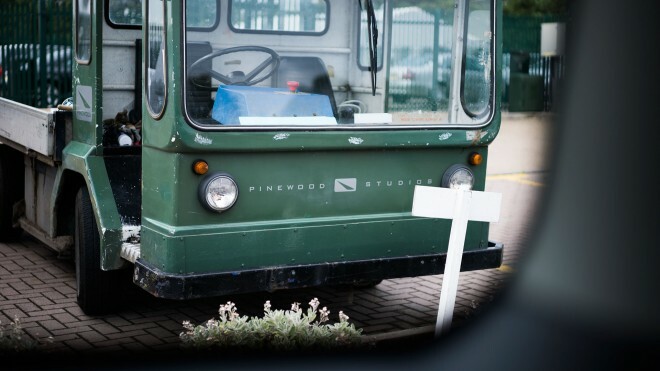 The Vocas A7/S handheld rig at Pinewood (first image on top of this page) is a nice piece of kit, which I briefly saw demonstrated. With the A7S being such a small camera it is sometimes necessary to rig it up for better stability and of course that matte box is going to come in handy for shooting S-LOG at the native ISO of 3200, where pretty strong ND filters are needed. 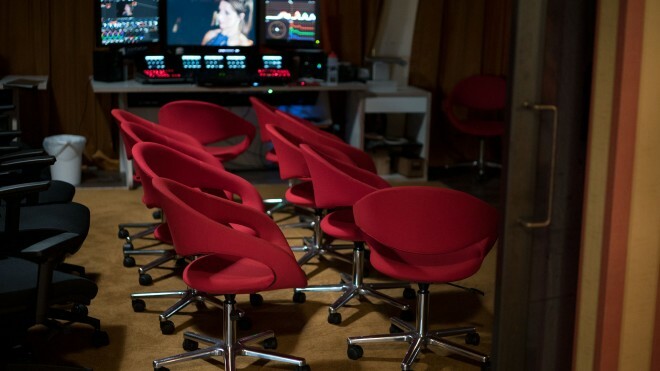 Sony had a post production suite as well as the camera presentation & test facility. The room shown above had a projection system and was based around Blackmagic Resolve. 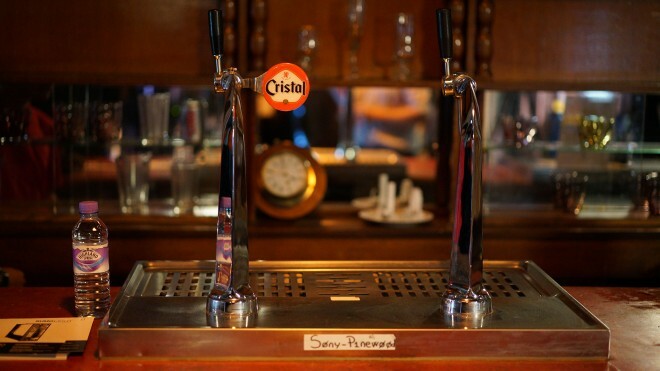 However the main reason for inviting press and filmmakers to the event though was not the beer! 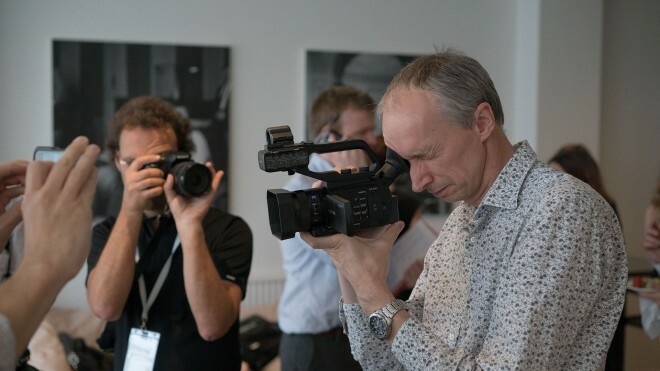 Here was the UK launch of the new Sony XDCAM X70. With core technology based around the consumer AX100, this is essentially the pro version of that camera. It shoots much better 1080p at 10bit 4:2:2 with XAVC not XAVC-S. However strangely it lacks 4K recording until a firmware update in 2015. The useful UStream live streaming ability won’t come until 2015 either. Mainly this camera then is for now a workhorse for the established videography community. 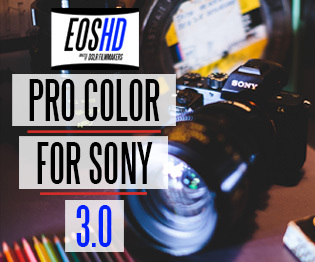 It is just not quite as interesting for most filmmakers as the A7S or indeed the now very affordable FS100, which I had hoped Sony would unveil a successor to here. Ergonomically the X70 feels more solid than the AX100. The dials and buttons were more convincing and gave better feedback. 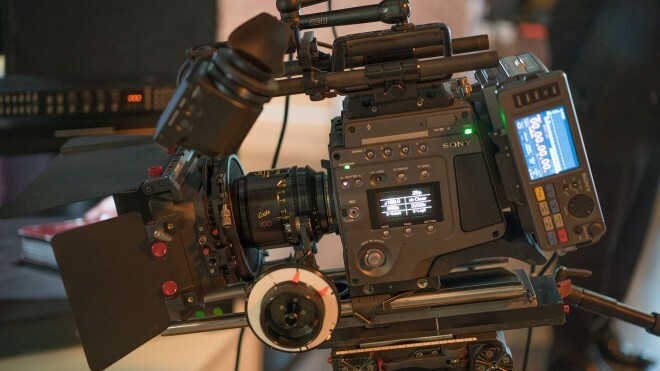 However I’d still like to see Sony move away from their ‘old-school’ camcorder layout on this type of camera. Let’s see something a bit more adventurous. Those tiny little buttons and dials are just not working for me I’m afraid! 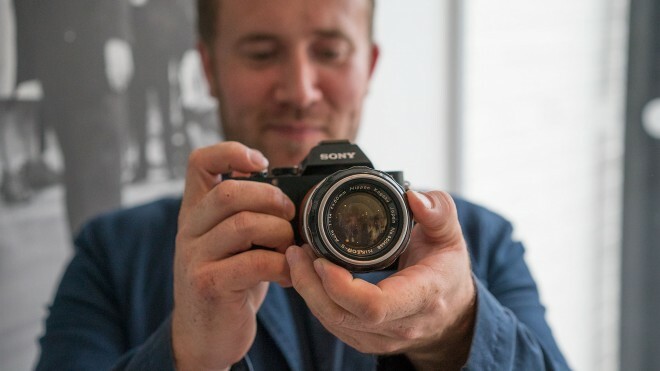 For a start I’d love to have a stepless aperture ring on the lens like the RX10 has. 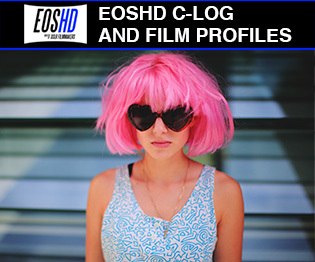 I’d like to see the profile shortened and overall the camera shrunk down. Do we need so many tiny buttons on the side panel? Then we’d have a nice hybrid containing the best of camcorder handling with the best of stills camera handling, a bit like how the Canon C300 turned out. The camera has a full sized HDMI port as well as HD-SDI. This XDCAM overall feels like a spiritual successor the traditional camcorder. If you need AF, a power zoom and stabilisation for a shot getter anyone can just point and shoot with it’s is a good option. Even though most creative production now pivot around interchangeable lenses and large sensors, the X70 still has a role to play. 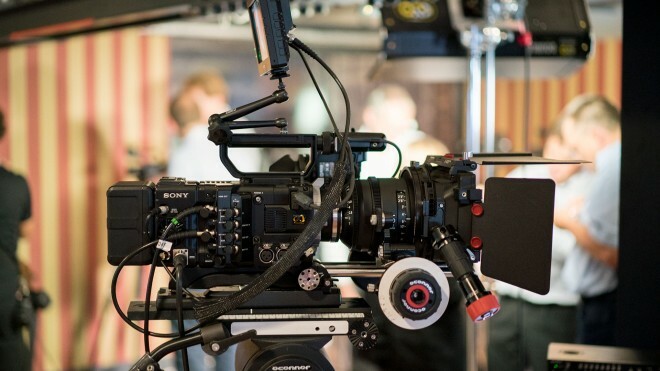 Even for cinematic production I am not against smaller sensors or Super 16mm. I love the look of something like the Digital Bolex which actually has a smaller sensor than the X70, and the X70’s 1″ sensor is much larger than in the truly small chip camcorder days of old. 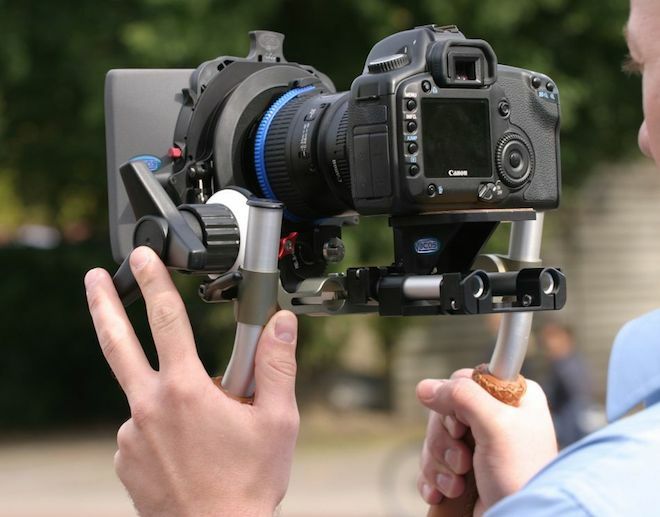 For filmmaking though the crucial difference is that the Digital Bolex though has an analogue CCD sensor and although rolling shutter is much reduced on the X70 compared to the AX100, the image isn’t as organic or film-like looking as film, or the closest digital equivalents. 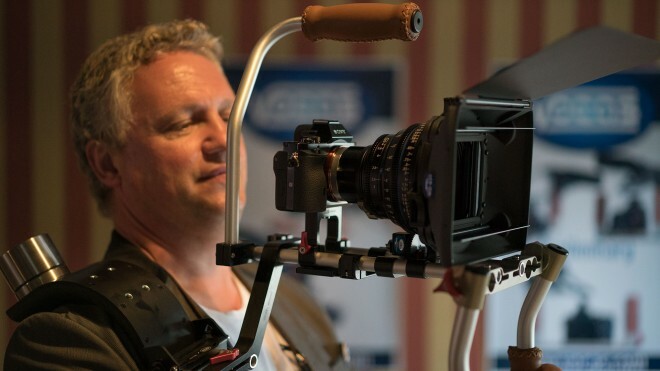 Now if someone can find out how to make the perfect ergonomic camera with Super 35mm sensor for news, run & gun and documentary shooters, they will have a winner on their hands.